Africa’s rare forest elephants which play a key role in replenishing the central African rainforests will need almost a century to recover from an onslaught by ivory poachers because of their slow birth rate, a study published on Wednesday said. The study by the New York-based Wildlife Conservation Society is the first analysis of the demography of an elusive animal that is hard to track because of its remote wooded surrounds. But the thickly-forested tropical range it inhabits has not deterred poachers, who reduced its population by a staggering 65 per cent between 2002 and 2013 to meet red-hot demand for ivory in China and other fast-growing Asian economies. “In the intervening time we are down significantly from that 100,000 – it could be as low as 70,000 now,” Peter Wrege of Cornell University, one of the study’s authors, told Reuters. “To come back to the population it was before 2002, based on their natality rates, it could take nearly a century to recover,” Wrege said. Much more is at stake than the fate one animal’s population: forest elephants are regarded by biologists as a “keystone species” playing a crucial role in the robustness of central Africa’s wooded ecosytems, the study, published in the Journal of Applied Ecology, said. Plant species depend on elephants to disperse their seeds in their excrement – big animals travel widely, eat a lot, and produce vast amounts of dung. The gaps that their bulk and diet create in thick vegetation also provide smaller creatures with pathways. “The structure of the forests would change if they did not have the elephants doing this dispersal,” Wrege said. The health of the central African rainforests has global consequences as they are the planet’s second largest carbon sequestration zone – which means they soak up carbon, slowing climate change. 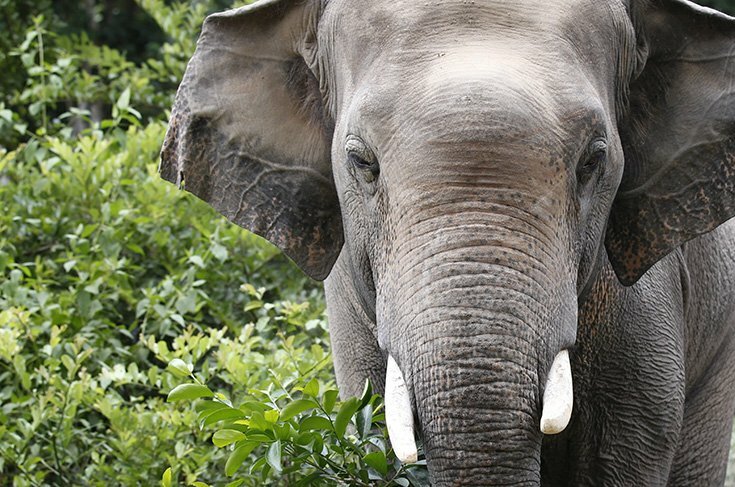 “Forest elephants are experiencing the greatest levels of poaching in Africa with potentially as much as 10 to 18 per cent of the population killed per year,” the study said. One of two species of African elephant – the other is the more numerous and larger Savannahelephant – the forest dwellers can hardly sustain this kind of lethal pressure because few other mammals reproduce so slowly. The study found females begin giving birth when they are around 23, about a decade later than their Savannah counterparts. And female forest elephants only produce a calf every five or six years, compared to the three- to four-year interval of their Savannah kin. Some of the worst poaching is taking place in forest-elephant range states such as Central African Republic and Democratic Republic of Congo – poor countries that suffer from bad governance and conflict. The findings come ahead of a major United Nations’ meeting in Johannesburg at the end of September where Zimbabwe and Namibia will push for permission to sell ivory stocks, a move opposed by many other African countries. Those seeking to open up the ivory trade argue it will raise badly-needed funds for conservation, but others say it would provide cover to poachers and make products that threaten species such as forest elephants socially acceptable. Overall, the illicit killing of elephants in Africa is believed to have declined from a peak of 30,000 in 2011 but remains far too high, according to a recent report.